Swimming Pool Terms You Should Know: What are Scuppers? When it comes to pools, there are some words that you need to know. 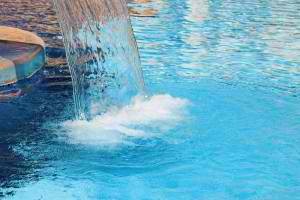 Filters, pumps, chlorine and pH… these are all common terms that even the most unversed pool owner often knows. But one term which often falls by the wayside is the term “scupper”. Just what is a scupper and why is it important? The term “scupper” has a nautical origin. Before they were incorporated into pool design, scuppers referred to as an opening or a slot on the boat deck which allowed for water to drain from the boat decking. Scuppers in swimming pool design work very much in the same way. With use of the scuppers, the water is able to flow directly into the pool. Scuppers were initially simple and practical in nature, but now you can find scuppers in a variety of different designs and created with a variety of purposes. For example, the motion of the water can be altered through a scupper so that the water is more tantalizing to both your eyes and ears. Scuppers are popular for a number of reasons, though one of the most compelling is their inexpensive qualities. Scuppers are cheap to operate, and can be as simple or as ornate as you’d like. Either way, bathers are treated to that soothing running water sound that can allow any backyard dweller to imagine as if they are lost in their own private oasis. Each of these designs can be arranged in such a way to create an intrinsic and completely customized design to truly enliven your pool and garden’s atmosphere.